WASHINGTON (World Bank press centre) — Advanced economies remain the global leaders in trade logistics, finds Connecting to Compete, a new World Bank Group report released today. Across the board, most countries have pursued logistics-related reforms and investments to build infrastructure, facilitate transportation and trade, or develop modern services. Despite this progress, the sixth edition of Connecting to Compete reveals a mixed picture. High-income countries score, on average, 48% higher than low-income countries when it comes to logistics performance. 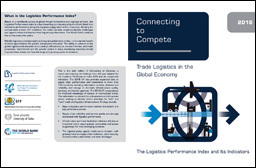 This sixth edition, the Logistics Performance Index (LPI) report, presents the latest worldwide view on trade logistics performance across more than 160 countries as seen by logistics professionals. A logistics labour shortage poses a challenge for both developed and developing countries alike. Developing countries seek more managerial-level workers, while developed countries face a shortage of blue-collar workers, such as truck drivers. High-income countries are more likely than low-income countries to be increasing their preparedness for cyber threats. High-income countries are more likely than low-income countries to seek logistics services that are environmentally friendly. This is important because CO2 emissions from transport are a significant contributor to pollution. Connecting to Compete and its Logistics Performance Index are tools created to help governments benchmark their progress on trade logistics across key criteria, including the quality of trade-related infrastructure, the price of international shipments, logistics competence and quality, and the frequency with which shipments reach their destination on time. Published biennially since 2007, the report uses both qualitative and quantitative measures to compare logistics friendliness across more than 160 countries.